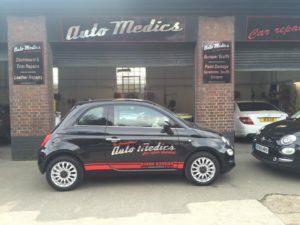 At Auto Medics, we feel not everyone realises that should your car need repair work following an accident, that you are at liberty to choose where you want to send your car; this could be for your added convenience, because you have trust in the work a specific repair shop carries out or simply because they are near to where you live. The downside of doing this is your insurer will probably retract their offer of a courtesy car. But we are here to tell you that it doesn’t matter, because at Auto Medics we conduct insurance repairs and we can arrange for a courtesy car to be available for the duration of your repair job, free of charge, if you make your request known when booking in the work. It’s also possible that the excess that you pay will be higher and the repair work won’t be guaranteed by your insurance company. If you are looking to use a garage of your choice simply check the terms and conditions of your insurance, get a quote from the body shop of your choice and forward for approval from your insurance company. For more information, get in touch with Auto Medics near Great Missenden on 01494 533 534.